Threads for embroidery are available in a wide range of fibers, colors, types, and weights. Your choice of threads will depend on the type of fabric used, the fabric thread count, and the type of embroidery you are stitching. There are very few hard-fast rules when it comes to selecting embroidery thread. Use the type of thread or weight that looks best, or has the effect you want to achieve in your project. Experimentation is often the best indicator of whether or not a thread will give you the desired look. If you are looking for contact information for thread manufacturers, click here. Embroidery floss is easy to find and comes in a huge range of colors. The six individual plies of embroidery floss can be separated, so you can use the thickness that is best suited for your project by combining plies. Visit the tutorial to learn how to separate floss without tangling. Always use threads from the same manufacturer in an embroidery project that uses floss, as the finish on the threads can vary from shiny to matte. Pearl Cotton is a single ply embroidery thread with a lustrous, pearly finish due to a process called mercerization. Pearl cotton is available in a variety of weights or thicknesses, and depending on the weight can be available in a twisted skein or in a ball. A wide range of colors is available for size 5 pearl cotton, with a lesser variety for size 8. Other sizes have a limited color selection. When selecting pearl cotton, remember that the larger the number, the finer the thread. Silk threads have a soft hand and are a joy to stitch with - but these threads can be expensive. Silk threads for embroidery are available in embroidery floss, pearl, and other weights, as well as fine ribbon. 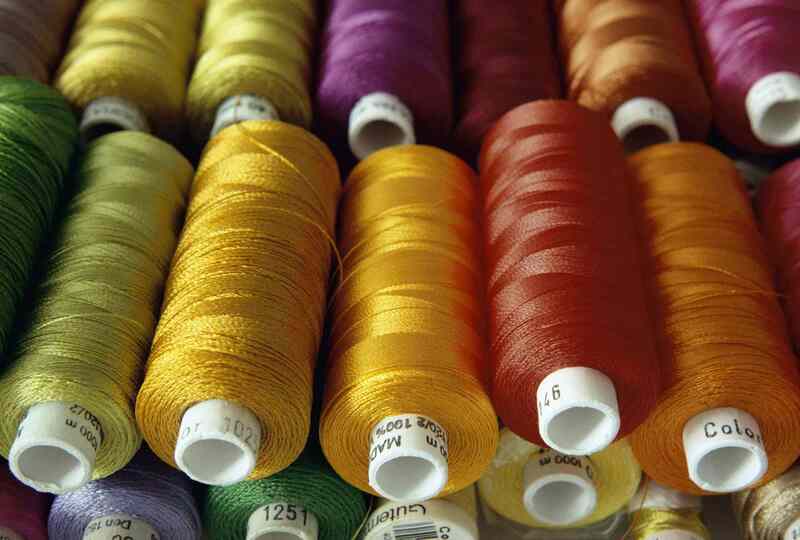 Use silk thread as you would any other thread. Use metallic threads to add glitz and glamor to your embroidery projects. Narrow weights of metallic thread can be stitched directly onto the fabric, while thicker or wired varieties should be couched to the surface of the project. Weights for metallic threads can be very fine and whispy to very thick and somewhat stiff. Metallics are also available in floss, single ply or pearl cotton varieties. Colors include gold, silver, and platinum as well as copper and antique or aged versions. Synthetics can be unruly to stitch with, so keep some thread conditioner handy when using these types of threads. Overdyed threads feature more than one color in a single strand and can be hand-dyed or mass-produced. Weights can vary, and overdyed threads are often produced in cotton or silk embroidery floss and in varying weights of pearl cotton. Overdyed threads are not to be confused with variegated thread or floss, which features varying shades of a single color. Wool threads come in a variety of weights, including very fine crewel wool, divisible Persian wool, and tapestry wool (most commonly used in needlepoint). There are many different types of ribbon that can be used for embroidery. These ribbons can be silk, cotton or synthetic and are available in varying widths, from a narrow 1/8 inch to 1/2 inch or larger. This thread is used in ribbon embroidery, utilizing a variety of surface embroidery stitches, or it can be used as a decorative accent with other types of embroidery. Floche is a size 16 mercerized, single-strand embroidery thread made from long staple Egyptian cotton. This lustrous thread has a soft, luxurious hand and is most commonly used in whitework, cutwork, openwork and needle painting. Use a laying tool when stitching using multiple strands of floche to keep the stitches smooth and even. Novelty threads encompass a wide range of styles, textures, materials, and supplies. They can be fuzzy, metallic, textured, leather, plastic and more! Novelty threads are a lot of fun to stitch with and can add a fuzzy texture to a project including using a fuzzy thread for hair or beards, and other special effects. These types of threads can be difficult to work with, so be sure to choose an appropriate, often simple embroidery stitch. Otherwise, you could be fighting a losing battle with the thread. Wired threads are not normally used for stitching, but are instead stitched to the surface of a finished design to add texture, dimension, and detail to a project. These threads can be bent, twisted and curled and hold their shape due to the hidden interior wire. The most common wired threads are Kreinik's HotWire and DMC's Color Infusions Memory Thread.